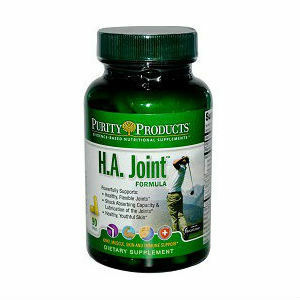 Purity Products HA Joint Formula is mainly based on the ingredient hyaluronic acid, known to play an important role in keeping joints healthy and flexible. Also called the ‘molecule of youth’, hyaluronic acid is the main compound in collagen, and it acts like a gel that prevents bone caps from rubbing against one another and cause the well known joint pains. This is the winning formula this supplement uses to help you reduce pain in your joints, and help you lead a happier, more mobile life. Let’s see together what other ingredients are used in this particular blend for healthier joints. What Does Purity Products HA Joint Formula Contain? BioCell Collagen® – this patented compound is based on Chondroitin Sulfate, Hyaluronic Acid and other proteoglycans, needed for making the ingredients easy to absorb. Hidrox™ – this compound is specific for fighting aging, as it is a powerful antioxidant. 5-Loxin® – this one is another ingredient that supports the production of collagen in the body, promoting joint health. While the patented ingredients are quite impressive, and the use of hyaluronic acid is highly commendable, we cannot help but notice that there is no mentioning of glucosamine sulfate, which is the most powerful ingredient in joint health supplements that truly work. On the other hand, taking this formula can have other positive effects, such as better looking, younger skin and hair, which also benefit from the great effects of hyaluronic acid. The recommended dosage for Purity Products HA Joint Formula is three capsules daily. Each bottle contains 90 capsule, or one month supply. The price per bottle is 54.95USD, which is in the same price range with other similar products. The company making Purity Products HA Joint Formula offers a 60 day refund policy, but only for unused bottles. So, in the event that you are unhappy with the product after using it, you may not be able to get a refund. Getting in touch with the company is easy enough, as contact information is readily available. Purity Products HA Joint Formula uses a particular blend for promoting joint health, and it seems that many consumers are enjoying its effects. However, it must be noted that the product does not seem to contain certain key ingredients for joint health, such as glucosamine sulfate. Mark Stevens	reviewed Purity Products HA Joint	on October 3rd	 and gave it a rating of 2.5.